Bug out bags are easily one of the most popular concepts in the prepper movement. 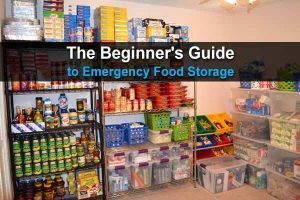 Even people who aren’t preppers associate bug out bags or go-to bags with emergency preparedness. For these reasons, the bug out bag is often the first thing new preppers put together. 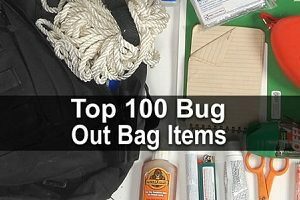 They make a huge list of all the items that their bug out bag needs in order to make the most complete bug out bag possible. But this is exactly where the problem arises: they fill up their bag with as many items as possible to the point where it is overstuffed and enormously heavy. Sure, you may be able to lift that bag over your shoulders now, but have you thought about hefting it while traveling over long distances? That is why you should make your bug out bag as light as possible. At the same time, you might not like the idea of sacrificing certain items that you feel are imperative to your survival. The solution is to replace your existing survival items with lighter and smaller versions of the same thing. No bug out bag is complete without a first aid kit. However, many of the first aid kits that you can buy are quite large themselves, almost to the point of being their own bug out bag. The good news is that you have options that are lighter and more compact. The First Aid Survival Box is an example. The First Aid Survival Box replaces all of the heavy and bulky first aid items that you would find in other first aid kits with lighter versions. This is still a complete first aid kit with over fourteen separate items including bandages, scissors, and a cold pack. Purification tablets are great for removing harmful bacteria and pathogens in water that you can’t see. Many filters aren’t even capable of removing these pathogens; they can only remove the visible harmful substances. Not only that, but filters can be quite bulky and cumbersome. As an alternative, go with purification tablets where each tablet can cure a quart of water in thirty minutes. This bottle contains over fifty tablets in addition to PA plus tablets that remove the taste of iodine in the treated water. Not only do you NOT need a huge Rambo knife in a survival kit, it’s actually more convenient to use a folding model with a smaller blade. This way you can clip the knife directly into your pocket and flip it open when needed, and you can tend to more precise tasks where a larger knife would be cumbersome. Plus, a folding knife can be more easily concealed if you want it to be. The Buck Redpoint Rescue Knife is a great example of what we are talking about. It features a rubber all-weather grip, a durable stainless steel bade, and a large release button that makes opening the blade incredibly fast and easy. A trash bag is easily one of the most versatile survival items you can have. With just one trash bag, you can make a poncho, stuff it with leaves and make a mattress, use it as a tarp for your shelter, set up a solar still to get clean water, and so on. 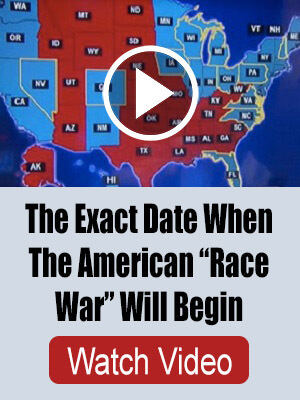 Just like that, you’ve already replaced multiple survival items that would have added a lot of bulk and weight to your bug out bag. In case you’re not convinced, here are 37 uses for trash bags. Many people are under the false assumption that the larger your flashlight is, the brighter the light will be. The reality is that there are a plenty of compact and lightweight flashlights that emit a very powerful LED light. The Surefire G2X Series is just one example, and beyond its maximum light output and compact size, it’s constructed out of an anodized aluminum bezel that is virtually indestructible. There’s no need to stuff a thick and heavy wool blanket into your bug out bag when you can just as easily carry a Mylar space blanket. On the contrary, space blankets will actually be warmer because they reflect your body heat back to you. What’s more is that these blankets are both windproof and waterproof, whereas a wool blanket takes hours to dry out after getting wet. The Sterno Outdoor Folding Camp Stove is a compact camping stove that operates using canned heats that you can also buy from Sterno. As the name suggests, the stove folds up and is very easy to assemble and disassemble. It’s a perfect option for portability and travel. Ziploc bags are another very versatile item just like garbage bags. They’re also so small and lightweight that you can carry lots of them without noticing a difference in weight. With a Ziploc bag, you can carry food and water, make a funnel, cover a wound, protect your electronic devices, and so on. Why carry a heavy bundle of rope in your bag when you could just as easily carry some wrapped around your wrist? Paracord bracelets are marvels in the survival world because the cordage can easily be unwrapped and applied to a multitude of survival uses, including building shelter, setting traps and snares, rappelling down steep cliffs, setting up a perimeter around your camp, and so on. This particular bracelet has a built-in compass, fire starter, and emergency whistle. Carrying tinder in your bug out bag is vitally important so that you can get a fire going quickly even when it’s cold, windy, and raining outside. Wetfire tinder is extremely lightweight to carry and will even burn when moist. Finally, the magnesium flint striker is one of the most traditional survival items on this list. It’s significantly more compact and easy to carry than a lighter or box of matches, and unlike either of those, it can start a fire even when fully wet (yes, there are so-called ‘waterproof matches’ but most of them are only water resistant). Most magnesium flint strikers have a hole punched near the corner through which you can run a thread in order to carry the striker as a necklace. 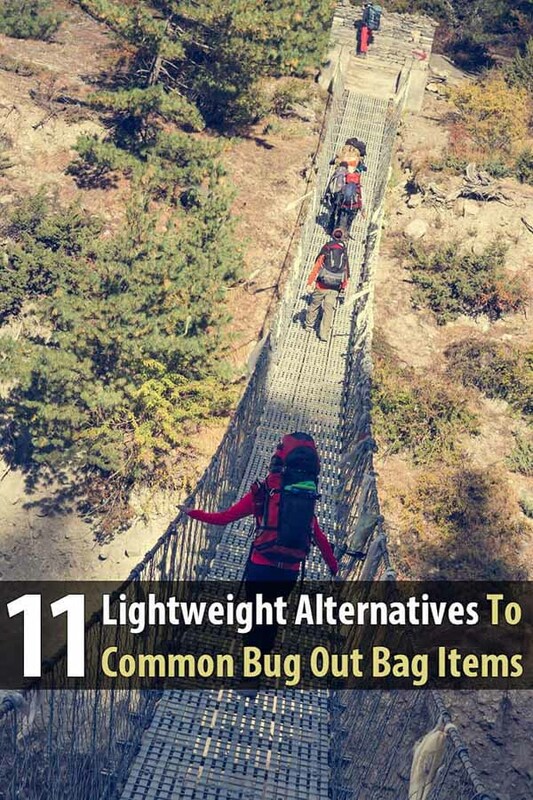 If your bag is still really heavy after making these changes, make sure you don’t have any items that don’t need to be in your bug out bag.